The final volume of the trilogy is rather a mish-mash compared with the first two; it was incomplete at the time of Leigh Fermor‘s death, and peters out before he reaches Constantinople, which we never hear about. What there was seems to have been tidied up by his editors, who have appended a sizeable section of his diary extracts from his visits to the monasteries of Mount Athos… and these I found the most interesting part of the book. The production of the book is clearly a tribute and a labour of love by Artemis Cooper and Colin Thubron; the map they include needed Leigh Fermor’s route and all the towns he visited marked on it, as in the previous volumes. This is a more personal volume than the previous two: there is detail about his parents, family and childhood background, which helps enlighten some of his life and some aspects of his personality. In the end, although I really enjoyed the three books, I felt the author too highly rated: he writes well, though his prose is rather overblown in places, and the raw material of the Athos diary at the end of this volume was actually far more convincing a travelogue; certainly to describe him as probably the greatest travel writer during his lifetime, as the wikipedia entry does, is to overstate the case: Robert Byron does Mount Athos better, and one could make a more convincing case for the greatness of, say, Wilfred Thesiger or Ella Maillart. However, I think I shall come back to these books in the future. Michael Asher seems to be exactly the right person to write what is probably the definitive biography of Wilfred Thesiger: he’s a seasoned explorer himself, and familiar with many of the places Thesiger explored. Thesiger comes across as a very conservative, dyed-in-the-wool aristocratic type, anti-democracy, anti-progress, in favour of people knowing their place – in short, a man from the past. He had a sufficient private income to fund whatever he did, and used to say that he had never worked a day in his life. He deplored the ease of modern travel. He sought to live with the local people, as one of the local people, in his travels in Arabia and Iraq particularly, although Asher makes it clear that this was, at the same time, on Thesiger’s terms, and within his power; although he rejected previous explorers’ aloofness, superiority and difference from local tribes and peoples, he couldn’t actually escape it himself: how much can an outsider blend in and become part of a tribe? Through interviews with some of those Thesiger travelled with, Asher shows both how much they accepted him, and at the same time how he was always an outsider. It’s as much a book about Asher as it is about Thesiger, in the end: Asher’s admiration of his predecessor shines throughout, though it is not romanticised, indeed it is often sharply critical; certainly Asher is clear about the many contradictions and inconsistencies in Thesiger’s life, and approach to people and exploration; he sees how Thesiger’s world-view was shaped and developed by his early experiences; he sees the flaws and self-delusion for what it was.. In the end, it boils down to this: what Thesiger liked was the tribes and peoples before they were ‘contaminated’ by contact with Western civilisation and technology, unspoiled, as it were, and he wanted them to remain like that, it seems almost in a zoo-like state, never mind that those tribes and people actually had the right to a choice about their futures and wanted progress and technology and Western medicine, for instance. To this reader, it seems that at times that Thesiger glimpsed the even bigger question about the nature of progress and what it does to us and our world, as a whole species, and unwittingly, but he was never able to ask the right questions at that level. 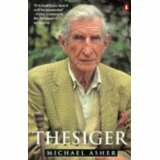 Asher was clearly fascinated by Thesiger the man, and the places he explored and peoples he lived with, at the same time as cutting him down to size and demythologising his approach; he recognises the greatness of his achievements as a traveller, and poignantly portrays his decline into old age. Ultimately we are all creatures of our times, and Thesiger was from a bygone age even as he began his travels; Asher’s travels are different, and equally fascinating, and his perspectives on the people and places he has explored are more relevant (if that’s the right word) because more securely anchored in the issues of our times. **I have written about some of Michael Asher’s travel books elsewhere on this blog; you will find them if you search the archive. If you visit my blog regularly, you’ll have realised I’m very interested in writing about travel. I have been doing some thinking about what has changed about our exploration of our world over the years. I suspect that nowadays most of us are tourists. Our journey has a set timeframe, a set destination, the travelling to and from is organised in advance, as is where we stay whilst away from home. We often take guidebooks and even phrasebooks. Even in distant, ‘exotic’ places we can be safe and comfortable. One of the things which concerns me about all this is the effects we can have on the lives and the economies of people in distant lands; thinking ‘well, we are putting money into the local economy’ isn’t necessarily the end of it. Travelling seems different. We may not set off for a specific amount of time, or have a set destination; we will probably organise travel ourselves ad hoc, and similarly accommodation. I think of my summers hitch-hiking in my student days. There are some unknowns and unpredicatables about this sort of journey, but we have maps, routes and nowadays all kinds of technology to help us. I find travelling harder to define, as I think about writers who come to mind who have set off for considerable lengths of time on arduous journeys well off the beaten track, and yet haven’t completely gone into the unknown… Ella Maillart and Peter Fleming in the 1930s travelling in Central Asia at times of great political unrest, Wilfred Thesiger crossing the Empty Quarter of Saudi Arabia, Michael Asher in the Sudan, Sylvain Tesson in Siberia recently. Such people never actually go off the edges of the map, as it were, into the places that used to be labelled ‘here be dragons’ but they do go where we are, even now, extremely unlikely ever to go, and they are definitely tested by their experiences. And then there’s exploration… new and undiscovered territory, though even here, there’s the necessary caveat, undiscovered by Western/ white people. Such journeys involve creating the first maps and charts of places, sometimes collecting specimens of previously unknown flora and fauna. Serious risks and dangers are involved here, from people, places, nature and the weather; in the past, before navigational aids were invented, one could become lost, or not be able to know where one was. And still they went. Scott to the Antarctic, the circumnavigators of the fifteenth and sixteenth centuries, Ibn Battutah on land much earlier, the nineteenth century explorers of Australia trying to find the huge inland sea that was believed to lie in the centre of that continent. To my mind, there’s nowhere left now for this kind of exploration; everywhere is ‘discovered’ if not completely known, and everywhere is accessible with today’s technology. The final frontier, in Captain Kirk’s words, is space. I’ll never read about that exploration. So, I’ve drawn up a rather simplistic taxonomy of journeys. And I suspect many of us would prefer to be thought of as travelling rather than as mere tourists, with the pejorative connotations of that word. But why do we go ‘away’? Why do you go away? For me, I think it is the change and challenge of being somewhere different, of seeing and experiencing things done in a different way, even the basic business of speaking; it is seeing the wonders of different places and cultures and being taken out of my insularity, it is realising how marvellously diverse our world is. Another fascinating second-hand acquisition, this book was written over half a century ago, to mark the centenary of the ill-fated Burke and Wills expedition which set out to cross Australia from south to north in the 1860s. Although they succeeded in making it to the Gulf of Carpentaria, they died on the return journey. As I read, I was struck by the similarity between their story, and that of Scott’s tragic journey to the South Pole. Both achieved their goal, both died on the way home. Scott and his colleagues died a few miles from safety, trapped by the weather. Burke and Wills, in desperate straits, arrived very belatedly at a support camp which their colleagues had left a mere nine hours before, after waiting for months and finally giving up hope that they were alive. I’ve read some accounts, but not many, of the exploration of Australia, and what has stuck in my mind is the sense of it as a totally alien continent to the first travellers. It was completely unknown to any other nation before European sailors finally encountered it; its only inhabitants were the natives, who had been alone there for thousands of years. Nobody knew what might lie in the interior of the vast continent: there was even speculation that there might be a huge inland sea in the centre. The harshness of the terrain and the climate (Burke and Wills record temperatures between 60 and 70 degrees Celsius!) reminded me of the accounts of travellers such as Thesiger and Bertram in the Empty Quarter of Saudi Arabia, but they had guides who knew the terrain. Moorehead’s account is clear and well-written, given the relative scantiness of the information available to him; there was a bit too much detail given to the investigations and commission of enquiry after the loss of the expedition, adn I would have liked even more detail to the maps that accompanied the text. This is one of the saddest books I’ve read in a long time. I’m old enough to remember the news stories about famine in the Sudan from the 1980s, and Asher tells the inside story with real people: this got through to me in a completely different way from the awful TV pictures. Asher spent years living in and learning about the Sudan, its desert tribes and their way of life and customs, and he participates fully in their travels, describing in detail, and with sensitivity and sympathy, but, more importantly, without romanticising the desert people; though he can understand and take part, he knows he can never be one of them. But he does also explain very clearly how the desert nomad way of life inevitably came to an end. Technology and change impinges on everywhere in the end, and the climate is also merciless: I finally understand what it means when ‘the rains fail’, and how people can be reduced to destitution and worse. A complex ecosystem that enabled people to live in some of the harshest conditions on the planet disintegrates in a few years and can never be put back together: this is the tragedy that Asher participates in and enables the reader to feel, as peoples’ pride, dignity, and eventually lives are lost. As I’ve read his three books about the desert (not in chronological order) Asher has gone up in my estimation – for what that’s worth – and I really do think that he is on a par with Thesiger and other, earlier desert explorers. After reading his first book (see recent post) I hunted down this his third – straight away. It’s the story of his journey across the Sahara from West to East, Mauritania to Egypt, with his wife, by camel, and, to my mind, confirmed him on a par with Thesiger and other desert explorers. This was clearly a very arduous and dangerous journey, undertaken for the love of travel, and getting to know the peoples whose lands he passed through. I was also pleased that there was a decent, useful map to track his travels – so often this is skimped or or omitted from travel books. They travelled with a number of different guides – clearly only a madman would travel without a local guide, though they did for a short distance – and it was interesting to see how differently they behaved. The authorities in each of the countries through which they passed provided their own challenges, and Asher recounts the changing face of desert travel and desert life, with the advent of the car and the truck, and the arrival of Westerners out for a quick dash in a vehicle across some desert, of which they necessarily must observe very little. Personally, I found the relationship between Asher and his wife tended to get in the way of the travel and description at times, but that’s probably rather harsh on my part, as they did travel together. Two very different reasons got me reading this – firstly, it’s about travel through deserts, specifically in Southern Sudan, and secondly, it’s by someone from my home town, and who went to the same secondary school as I did for a while, though we were separated by a year or two (I never knew him). Very quickly it became clear that Asher had fallen in love with the desert, and the ways of desert people: he lived and travelled with them, spoke their language and wanted to learn from them – in short, someone in the footsteps, at least, of Thesiger and the like, although I learned, from an interesting article in wikipedia, that Asher would not agree with this. At first, I felt he was romanticising the desert tribes and their way of life in the way that a (relatively) affluent westerner could, in that at any time he could leave, and return home to our way of life, whereas those who came from the desert and lived there could not. However, there developed a deeper understanding, it seemed to me: he was drawn to explore (illegally at times) territories that were a war zone at the time (late 70s/ early 80s) looking for ancient travel routes across the desert, although ultimately thwarted in that search. He learned as much as he could about camels, in order to know how to buy the most suitable ones for his purposes. And he sought to share all aspects of the life of the desert. He writes well, and carefully, with an eye to explaining what the uneducated western reader will need to know to understand what he has to say, as well as describing the beauty (as he perceives it, in contrast to those he travels with) of the desert. And he is drawn deeper, to reflect on the inevitable changes that technology and globalisation are having and will have, on these societies, which he refuses to see as ‘primitive’ in our terms, recognising that, although their life seems harsh and basic to us, they have (or had, until recently) all that they needed to live and survive. There are messages for us, here, about the nature of sufficiency, and contentment. This post is prompted by a recent find at Aardvark Books, which I’ve mentioned before. Alone Through the Forbidden Land, by Gustav Krist narrates the adventures of this Austrian traveller in Persia and other Silk Route countries in the 1930s, when much of the area was ‘closed’ to foreigners for various reasons, not least being that a considerable part of the area had only recently been annexed to the Soviet Union. Krist (who I’d never heard of before) had been an Austrian prisoner of the Russians during the First World War, which made his travels even riskier. I really enjoyed the book. Krist covered territory and peoples which I never tire of reading about, and came across as a real traveller with curiosity about, understanding of, and sympathy with, the people among whom he was travelling, willing to share their lives, and to take risks to find out… an explorer, I suppose. For me, he fits in with the other interesting travellers of that time, such as Thesiger, Thomas, Maillart and Fleming. I much prefer to read accounts from the days when travelling involved effort, privation and the unknown, for people who really wanted to get to know people and places. This is very different from travelling nowadays, which I think is more correctly called tourism: it is now so easy, and quick, to get to anywhere on the planet; one is protected by Western medicine and technology from most dangers and risks, and so there seems to be little real adventure involved in going to faraway places. Increasingly, too, I think Westerners are parasitic on other societies, and our needs as tourists warp and deform the lives and needs of the local inhabitants who are drawn in to service us. We have the money to buy the time and the luxury of travel to anywhere on the planet regardless of our effect on our world, others’ worlds and their environment, and what do we learn? Do we even think about such questions? Reading the book, I got the sense of a world that was gradually and inevitably changing as modernity caught up with it; this is a double-edged sword, in the sense that such things as modern medicine, and some modern technology have the ability to transform people’s lives, that people often lived under cruel and barbarous regimes (but then so did they in the ‘civilised’ West quite frequently) in states of great poverty and need, that such people often crave the benefits of the West, and yet here, we are so often dissatisfied with what we have, and yearn to get away from it all. The book is well-written, illustrated with some of the author’s photographs, and has a decent map to enable the reader to follow his journey – this is always an added bonus, and often sadly lacking in more recent and cheaply produced books.